At ProSmiles Dental & Orthodontics, watching patients see their brilliant new smile for the first time is the highlight of our days. 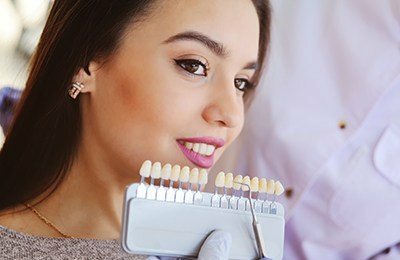 Veneers can dramatically transform a smile, and this service is sometimes referred to as “instant orthodontics.” A set of veneers can correct chips, stains, and even deeply discolored teeth. They can also alter the length and size of teeth or help give the appearance of a straight tooth, hiding crookedness. While it may sound dramatic, it isn’t. Veneers provide a highly conservative approach to esthetic smile makeovers! Veneers are one of dentistry’s ultimate combinations of dental art and science, handcrafted and customized to fit your smile. These paper-thin pieces of porcelain bond to the outside of your natural teeth. But just because they’re thin, don't be fooled. Veneers are highly versatile and can replicate all the complex nuances of a natural tooth. There’s a lot of diagnostic work and careful planning that goes into a treatment plan that includes veneers. Models, photographs, and digital X-rays allow you and our team to create a perfect blueprint to guide your treatment from start to finish. Like all successful projects, this planning can't be compromised. Dr. Lankupalli and Dr. Patel will consider your input and incorporate your desires into your veneer case, from color to shape and everything in between. Once Dr. Lankupalli and Dr. Patel plan your case, it will take around two appointments before you leave with a stunning new smile. At the first visit, the teeth are gently prepared to allow space for the ultra-thin porcelain to be crafted by a master lab technician. Dr. Lankupalli and Dr. Patel will create temporary acrylic restorations that mimic the veneers, which you’ll wear for up to three weeks. These temporaries provide a preview of the general appearance of your new smile and lets you try it out to see if any further changes are needed. After your veneers have been masterfully crafted to you and our doctors’ specific instructions, you'll return for a second appointment. Dr. Lankupalli and Dr. Patel will place each veneer and evaluate the appearance and fit, giving you an opportunity to preview the new look. They will go through several steps to precisely bond the thin veneers to the surface of your teeth, creating an incredibly strong bond between enamel and porcelain. Minor adjustments to your bite and a final polish will leave you with a smile that may have you wondering why you waited so long to find ProSmiles Dental & Orthodontics.